KVM display management systems developer IHSE USA has partnered with VuWall, a provider of visualization solutions for controlling, managing, and collaborating on graphic information for video walls and multiscreen structures. The partnership aims to address a gap in the market, allowing companies to scale their KVM outputs to display walls or multi-view displays through a single, integrated control interface. The integration of the IHSE KVM matrix and VuWall systems makes it possible to control and visualize all sources from the matrix switcher onto the video wall. With this system, multiple sources can be switched and displayed simultaneously on the video wall. With VuWall's collaborative interface, operators have all critical data and information at their fingertips from a single interface. It's also possible to mix in other sources from other systems, such as IP streams, applications, and websites. 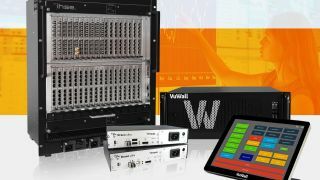 At the 2019 NAB Show, the VuWall system is connected via an IHSE Draco vario compact matrix system and HDMI extenders. Multiple types of video sources will be distributed through the KVM matrix and extended to a 2x2 wall display, where multiple sources will be displayed simultaneously. Operators will control the content layout on the video wall via the VuScape video wall controller using a VuWall touch panel for quick macro access of predefined layouts. Users can interact with the matrix from a local keyboard or from the touchpanel interface. Communication between the IHSE and VuWall processors happens thanks to the IHSE API, through which buttons and images can be defined by the operator for a more graphical user experience. The combined offering aims to create a new distribution category for the AV integration market at a time when those in the broadcast, entertainment, and government command and control verticals are seeking cost-effective solutions for interactive knowledge walls. This collaborative interface gives the operators complete control from a single surface. The interface also allows operators to resize all windows across the complete input range and access multiple sources, even if they are on segregated networks. Interfaces can be set up in any configuration with operator-accessible templates and groups.